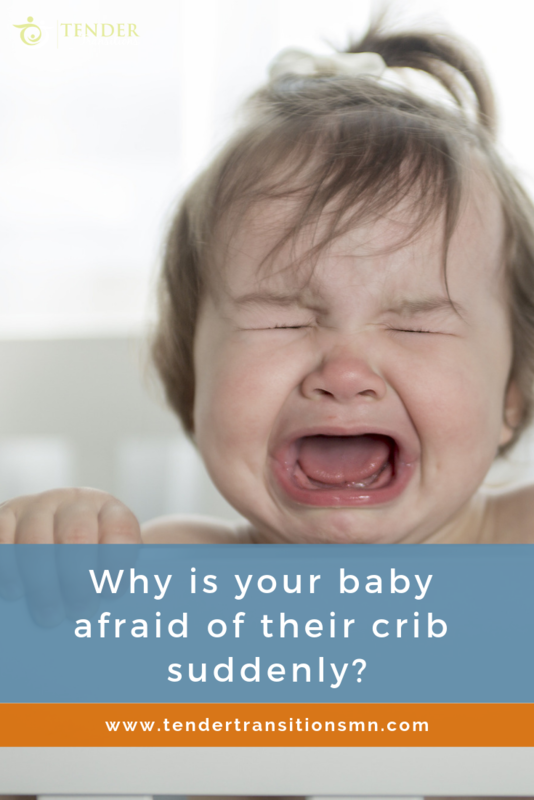 Why is your baby afraid of their crib? Can you relate to this scenario? Your family has taken the initiative to develop better sleep habits and you’ve started enforcing your new sleep routine. Then all of a suddenly on day 3, your little one has developed a new found aversion for his or her crib. The second you put her near the bed, your baby cries out. Your little one has become afraid of their crib. 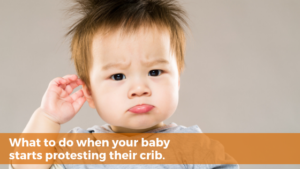 So, why has your little one decided to suddenly protest and fear their crib? As parents, we don’t want to see our little one upset or sad. We want them to feel safe, happy, and loved… and want them to love their bed and sleep. Unfortunately, it’s not uncommon to have this ‘side effect’ when you start your sleep training journey. But the benefits of enduring this side effect is well worth it – consistent full nights of sleep. 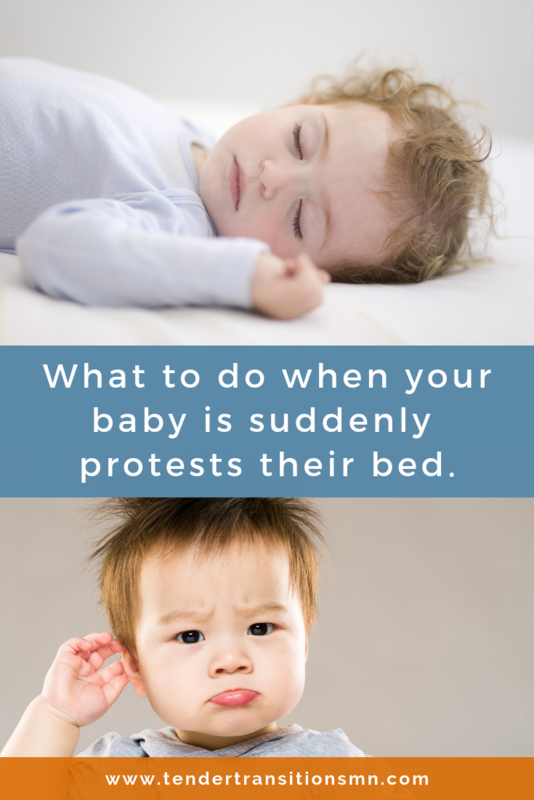 Why is your Child Protesting their Bed? One of the main goals of sleep training is to give your child the skills to fall asleep on their own… in their own bed or crib. At the start of this training, you will be putting in place some new routines; routines that your baby is working hard to learn so he or she can develop more productive sleep habits. It is not always smooth sailing as your baby learns this new, improved way of doing things. If your little one is used to falling asleep while bottle-feeding or being rocked back to dreamland every time that they wake up, it will take time to learn how to do it themselves. It is hard to break ‘old’ habits and even though your little one is young, they have already developed their own sleeping habits. The Good News – this aversion is temporary and short term. I actually tell parents that this is a good thing. 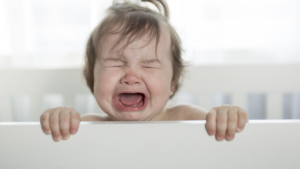 Your baby realizes that their routine has changed and is starting to recognize that the consistent bedtime routine means that they’re getting close to bedtime, which they may have some anxiety about. And it’s natural that your baby is a little anxious, she/he hasn’t learned how to do it yet and everything seems new and changing. What to Do during this Transition. Be patient. Your little one is learning new skills and will get better and better. Use soft, soothing tones when you put your baby to sleep. Create a calm, safe environment. Reassurance – remind him that it is bedtime and that everything is okay. Be Consistent – follow your routines, stick to your plan, give stability. It’s amazing how quickly babies do get over this fear and learn to put themselves to sleep. They’ll surprise you and start going to bed happy. Your child will learn to love their crib. As they grow up they will become a healthy secure child who recognizes when they are tired and want to go to sleep. If want to start experience peaceful nights, but don’t know where to start, we would love to chat with you.